Aiseesoft DVD to iPhone Converter for Mac is a professional Mac DVD to iPhone Converter with user-friendly interface. It is the fastest and best Mac DVD to iPhone converter software that designed for Mac users to rip DVD to iPhone (3G) for Mac. Aiseesoft DVD to iPhone Converter is the best DVD to iPhone converter because it borns with powerful video/audio editing functions. Aiseesoft DVD to iPhone Converter allows you to do video trimming, video croping, select subtitle and audio track, even merge several titles or chapters into one file. With it you can easily enjoy your DVD movies on your iPhone/iPhone(3G) anytime and anywhere. 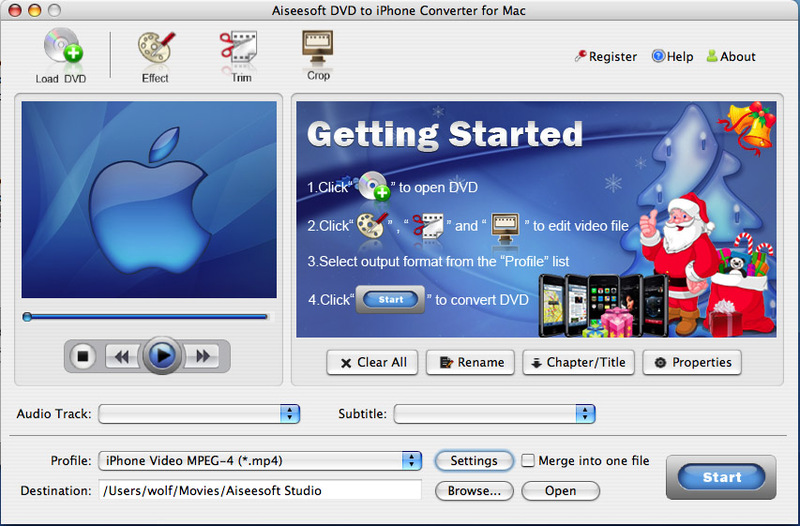 Aiseesoft DVD to iPhone Converter for Mac can convert any DVD to iPhone and iPhone(3G) MP4 and MOV video. In addition, it could also convert DVD to other iPod. Aiseesoft DVD to iPhone Converter for Mac provides video edit functions as many as possible.Trim, Crop, Snapshot, Settings and Merge. The best Mac DVD to iPhone converter enables you select audio track and subtitle. Qweas is providing links to Aiseesoft DVD to iPhone for Mac 3.1.18 as a courtesy, and makes no representations regarding Aiseesoft DVD to iPhone for Mac or any other applications or any information related thereto. Any questions, complaints or claims regarding this application Aiseesoft DVD to iPhone for Mac 3.1.18 must be directed to the appropriate software vendor. You may click the publisher link of Aiseesoft DVD to iPhone for Mac on the top of this page to get more details about the vendor.